30cm by 13.5cm. We are only passing on the costs associated with getting the item to you safely and in one piece. Excellent Condition. Rest of the World. This deep Star shaped Bowl makes a great dish for all sorts of treats this Christmas. The holly and the ivy. The holly bears the crown. M ade in China. Dishwasher, Microwave and Freezer Safe. Oven to table ware. This Holly shaped Dish is great for serving up all sorts of Christmas foodie treats. The holly and the ivy. The holly bears the crown. M ade in China. They are designed in our studios in Stoke on Trent, England. The holly and the ivy. The holly bears the crown. M ade in China. The cake stand is approx 10.5" across. It is bra nd new, base stamped and boxed. Portmeirion, The Holly & The Ivy, Oval Handled Platter, 18" across, Boxed. This lovely item is unused and in the original box. The holly and the ivy. The holly bears the crown. M ade in China. This Star shaped Bowl makes a great dish for all sorts of treats this Christmas. I think they have been discontinued. The holly and the ivy. The holly bears the crown. M ade in China. Portmeirion, The Holly & The Ivy, Oval Handled Platter, 15"
The patter of Holly and Ivy is printed to the outside and inside, so it looks beautiful even when empty. Presented in a stunning gift box, this set also makes for a brilliant Christmas present. The holly and the ivy. The holly bears the crown. M ade in China. Hors D'ouevres, Cheese Or Nibbles Serving Dish Or Plate. 33cm by 26cm 13" by 10/14". SP19/SW/06/02/18/237/16. We are only passing on the costs associated with getting the item to you safely and in one piece. Perfectly capturing the joy of a traditional English Christmas, The Holly & The Ivy is a classic collection for the festive season. The stunning illustrations that adorn the delicate earthenware bring the spirit of the season to any table. 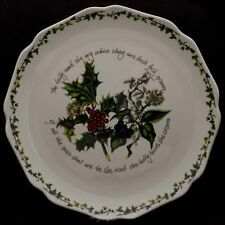 Portmeirion The Holly & The Ivy Christmas Tree serving plate dish. 13"
Looks fabulous piled high with little mince pies. The dish is in very good condition. Holly and Ivy Design. Star shaped dish.